Down the mountain, below Laurel Hill, I found a road along the creek, spotted a wide spot on the muddy track, parked the truck and climbed into the bed for a few hours of sleep before steelhead fishing in the morning. Just like the old days. Rain thrummed atop the vehicle all night long, but I noticed, as I climbed out, that the raindrops fell now from tree limbs. There were stars in the clearing sky. Mia Sheppard was at our meeting place ahead of me, a cup of coffee in her hand. I climbed in the passenger seat and we wound down out of Sandy to Dodge Park as the sun came up. It takes a lot of rain to muddy up the Sandy River in April and after a day of pounding, it still ran with a visibility of about four feet. We pushed Mia's pontoon boat away from the launch, jumped in and let the current pull us into a tricky boulder field. Mia was good on the sticks. This was not to be a guided trip. We were going to talk about public lands and policy - Mia is a field representative for the Theodore Roosevelt Conservation Partnership (TRCP) - and she, with her husband, Marty Sheppard, is also a river guide and outfitter. The Sheppards, who live in Maupin, are one of the fishiest families in the Northwest. We guessed there was one boat ahead of us, and after passing some good steelhead water, we found them. River guide Brian Silvey was on the first good Spey water with two clients. We pulled out across the river from them and strung our rods and watched them work through the long run on the other side. Because I wasn't a paying client, and Mia is nothing if not polite to her fellow guides, she didn't try for first water. Silvey must have been thinking about other water downstream, because it wasn't long before he'd gathered his clients and they drifted around the bend. We crossed to the other side, pulled up where Silvey's boat had been, and shook out our lines. I took the best water, wading in to the center of the run and Mia waited behind me to see if she could give me a casting lesson. I learned a long time ago when an expert wants to offer free advice it's a good idea to listen. She explained I needed to start the cast to the side, in the "key position," then she made an adjustment to my tip position at mid-cast. Then she walked upstream to start at the top of the run. Spey fishing is new to these ancient waters. 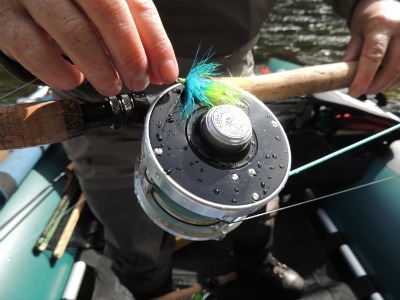 A form of fly-fishing that evolved on the river Spey in Scotland in the mid-1800s, the rod is long, which allows a finesse presentation of a salmon or steelhead fly, on a downstream swing. "Whoa, fish on!" I turned and saw Mia, her rod arced over, the morning sun behind her, fog lifting of the water. A spray of water droplets blew off as the line knifed through the surface and then I saw the tail as the fish changed direction. In a few minutes, Mia knelt in the cold water and twisted out the hook. The fish stayed alongside in the shallow water, then, like a shot, it streaked by me, a six-pound wild female. We finished out that run then climbed back in the boat and drifted down to find more water. There might be steelhead spread throughout a river, but good Spey water moves at about the speed of a fast walk and is anywhere from 12 inches to 12 feet deep. "I think a lot of people don't fish the shallow water enough," Mia said. "Where that fish was, it was only 18 inches deep." And Mia was the second person to fish that run that morning. Soon Mark Bachmann's boat appeared around a bend in the river upstream. Mia waited for him to pass us, to find the water he wanted before we got there. Bachmann is the owner of The Fly Fishing Shop in Welches, and, for the rest of the day, we'd bounce around with Silvey and Bachmann, doing a three-boat weave looking for Spey water. We left a lot of water untouched. Places I'd caught steelhead before, we drifted by on our way to the take-out at Oxbow Park. A few spots we would have fished, we passed up because there were so many spawning redds in the river. The Sandy, absent Marmot Dam, is showing a remarkable resiliency and wilderness character for a stream so close to Portland. 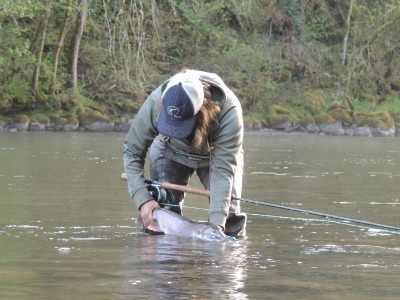 There are winter steelhead, spring chinook and summer steelhead in the river in April and May. This is a year when the water is going to get dangerously low. If the river calls, heed it early this season. If you swing a fly, be on the river at dawn, but don't despair if you don't get first water, there are fish to be caught even behind the best anglers. Gary Lewis is the host of Frontier Unlimited TV and author of John Nosler – Going Ballistic, Fishing Mount Hood Country, Hunting Oregon and other titles. Contact Gary at www.GaryLewisOutdoors.com.